• White LED Light (Gold/Black Version). • Red LED Light (Red Version). The cool air intakes from the bottom creates efficient air flow for quick heat dissipation. 805 features include increased strengthen case stands with four shock-proof rubbers providing the 805 with steady floor or table surface gripping. • Front fan bracket equipped for easy installation of fans, liquid cooling radiators, and HDD cage. • Affixed thumbscrews on side panels for easy installation and removal. • Dust filter has an embedded magnet design for easy removal creating a convenient installation and more importantly excellent dust reduction. Features • Premium Material: Steel, Anodised Aluminium and Tempered Glass. • Full Water Cooling Support: Open construction allows for for watercooled installation. • Next Gen Connector: Ships with USB 3.1 Type C.
• Low Noise: Shockproof Rubber Feet minimise Noise transfer. 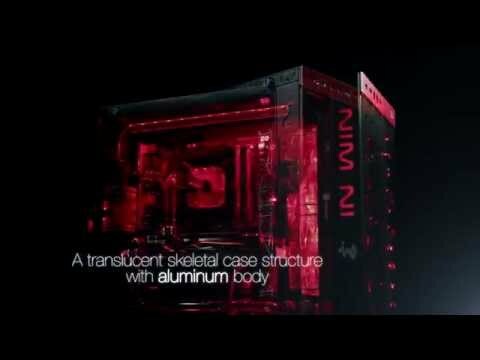 In Win 805C Mid Tower Computer Chassis, Black/Red, ATX/Micro ATX/Mini ITX, Tempered Glass USB 3.1 C, Red LED Logo is rated 3.0 out of 5 by 2. Rated 5 out of 5 by George634 from Great looking product Exellent case layout managed to fit an ASUS Maximus Hero 8 board with little or no trouble, an EVGA supernova fit well. Had to drill out some of the holes in the plate to fit the water cooler but wasn't too hard too do. Excellent case, plug and play. Rated 1 out of 5 by Z3r0 from Only intended for low specs components Be aware that this just a visual trap. The case as visual looks nice and it feel nice but if you want your computer to die more fast then is intended then purchase this case. To take it to the point , running The Division on a i7 6700k with aio kooler(kraken x61 in push pull configuration) and a gtx 980TI the temperature in the case was around 40 C . And this in just 20 mins. Basically if i wanted to fry some chips and save energy this was the solution for it by using the glass of the case as a cooker. It lacks air flow and the only intake option is a 120 mm fan in the bottom of the case. You was WARNED!